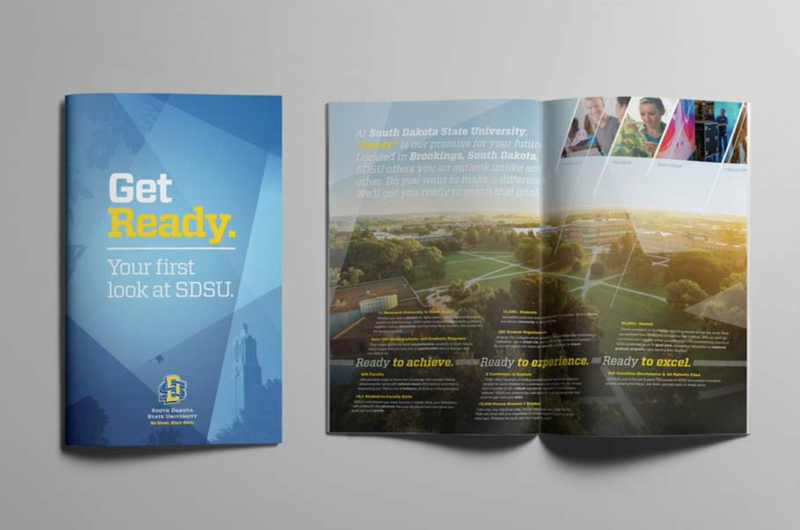 Name an advertising project and I’ve worked on it for SDSU. Scripts for radio and TV spots, a suite of resources for Admissions across their acceptance cycle, a range of billboards and mall posters sharing the university message, even a fact sheet for every single major in the college. If danger strikes, I can probably fill in as a university rep for a week or two. Over the course of our relationship, one of the things I have valued most is the growing trust SDSU’s team has placed in my choices to “own the extraordinary.” There is an “ahh, shucks” mentality in South Dakota that for many years has kept the University from championing their truly incredible research discoveries, programs and job placement rates. Part of my role has been to encourage bringing that kind of language into the University narrative for prospective students and donors alike. Such stories have been key to the success of the “Ready to Impact” campaign. They’ve been the inspiration behind the bold lines that generate such excitement for an education that invites you to take a risk instead of a seat as you prepare to change the world.